In retrospect, it was crystal clear. When Honda released an image of the Odyssey Logo created entirely from Cheerios to tease the debut of this refreshed 2014 model, every single family man in the office should have made the obvious connection. Curiously, it was one of young bucks in the office that realized what Honda was up to: “I bet they’re gonna have a built-in vacuum in there,” he said. The collective indifference was palpable. As it turns out, our super-dad in training was spot on. When Honda pulled the wraps off the refreshed 2014 Odyssey in its top-spec Touring Elite trim, the appropriately named HondaVAC was installed, ready to inhale all the errant cereal, dog hair, and pocket change your brood can dish out. All Honda Odysseys receive minor exterior enhancements for the 2014 model year, including a re-sculpted aluminum hood, new aluminum fenders, a new grille, and a reworked lower fascia with chrome-ringed fog lights. The projection-beam headlight housings get a darker finish, and the mirrors get a two-tone treatment. New LED taillamps and a fresh badging motif finish off the look. Many structural improvements have been made, which Honda speculates will help the Odyssey achieve top marks in safety tests, although no one’s yet run the 2014 into anything to gather official ratings. The Odyssey Touring Elite also will get standard nanny systems like forward collision warning and lane-departure warning, and the vacuum is standard here, too. Interior trims have been updated, and a bevy of standard and optional features are available for dad to geek out on, including HD radio, keyless entry and start, a text-message reading function, and HondaLink, which uses an occupant’s smartphone to access internet radio, Facebook, Twitter, and other apps. 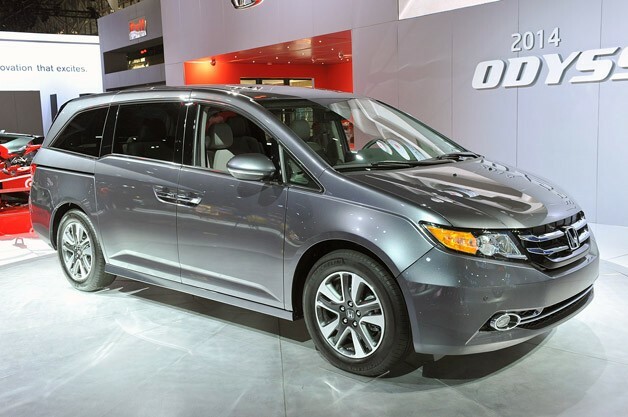 Pricing will be released closer to when the 2014 Honda Odyssey goes on sale this summer.